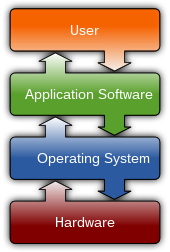 A diagram showing how the user interacts with application software on a typical desktop computer.The application software layer interfaces with the operating system, which in turn communicates with the hardware. The arrows indicate information flow. At the lowest programming level, executable code consists of machine language instructions supported by an individual processor—typically a central processing unit (CPU) or a graphics processing unit (GPU). A machine language consists of groups of binary values signifying processor instructions that change the state of the computer from its preceding state. For example, an instruction may change the value stored in a particular storage location in the computer—an effect that is not directly observable to the user. An instruction may also invoke one of many input or output operations, for example displaying some text on a computer screen; causing state changes which should be visible to the user. The processor executes the instructions in the order they are provided, unless it is instructed to "jump" to a different instruction, or is interrupted by the operating system. , most personal computers, smartphone devices and servers have processors with multiple execution units or multiple processors performing computation together, and computing has become a much more concurrent activity than in the past. The majority of software is written in high-level programming languages. They are easier and more efficient for programmers because they are closer to natural languages than machine languages. High-level languages are translated into machine language using a compiler or an interpreter or a combination of the two. Software may also be written in a low-level assembly language, which has strong correspondence to the computer's machine language instructions and is translated into machine language using an assembler. Consistent with its goals, only free software is used on FSF's computers. Google Earth is a free-of-charge, downloadable virtual globe program. It maps the earth by superimposing images obtained from satellite imagery, aerial photography and GIS over a 3D globe. 'William Henry Gates III, (b. October 28, 1955), commonly known as Bill Gates is the founder, chairman, former chief software architect, and former CEO of Microsoft. He is consistently ranked in the Forbes list of the world's wealthiest people. Between 2009 and 2014 his wealth more than doubled from $40 billion to more than $82 billion. When family wealth is considered, his family ranks second behind the Walton family. Gates is the first one to reach the richest peak from the technology world. Gates is a leading philanthropist, and has stated that he intends to give away the majority of his vast wealth. He and his wife set up the Bill & Melinda Gates Foundation (B&MGF) in 1994 with the aim of improving health and combating poverty in developing regions across the world. He has attracted considerable acclaim for the Foundation's work, including its work in combating HIV infection in Africa. Gates finally quit day-to-day responsibility at Microsoft in June 2008 in favour of running the B&MGF after a long period of moving away from executive control, originally as CEO, then as 'Chief Software Architect'. Gates remains chairman of Microsoft. ...that BIOS software is built into personal computers, and is a type of system software? Software is also part of the wider categories Computing and Computer Science. ^ "FREE SOFTWARE FOUNDATION, INC. Summary Screen". The Commonwealth of Massachusetts, Secretary of the Commonwealth, Corporations Division. Retrieved 2009-04-06. ^ Stallman, Richard M. (2002). "Linux, GNU, and freedom". Philosophy of the GNU Project. GNU Project. Retrieved 2006-12-10.